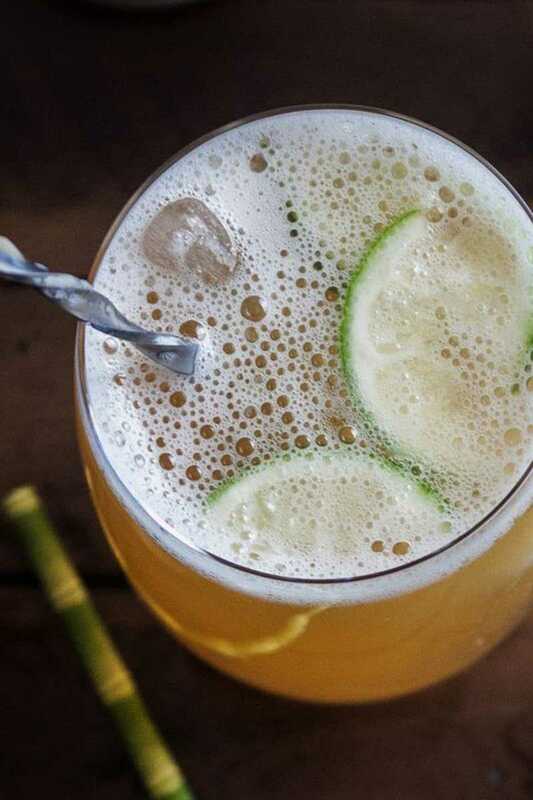 This IPA cocktail is essentially a shandy spiked with rum. A strong, spicy, gingery and overtly hoppy shandy mind you. If you like IPAs and the taste of fresh brewed ginger beer, you could easily fall in love with the libation. We mixed it for our friend Leslie’s blog, From Play Dates to Parties. She and her husband love entertaining, good food and cocktails and craft beer makes frequent appearances in their home – in recipes too. Like these Molasses & Stout Cookies with stout infused icing she made for our readers not long ago. Because this particular IPA cocktail is inspired by the classic combo of ginger beer and rum known as Dark ‘n’ Stormy, we thought we could call it Stormy IPA. What do you think? Even though we mostly drink our IPAs (as you well know there can be sooo much going on in one, aromas and flavor wise), we enjoy mixing the occasional IPA cocktail. In our view a carefully selected IPA can brighten up many of a classic cocktail. Remember the recipes for Session IPA Beergarita and IPA Piña Colada we posted? Or my personal favorite poolside frozen drink, the IPA Mango Slushie? All of them let the most popular craft beer style in America take center stage and taste incredible. While we love to indulge in a refreshing IPA grapefruit shandy during summer, the holidays are traditionally the season for ginger beer and its alluring spicy bite. This IPA cocktail combines that bite with the hoppy pungency of your favorite IPA. We actually went with a well balanced, slightly dank one (Odell IPA), but feel free to choose a more piney one or go low key with a dry hopped and citrusy variety. 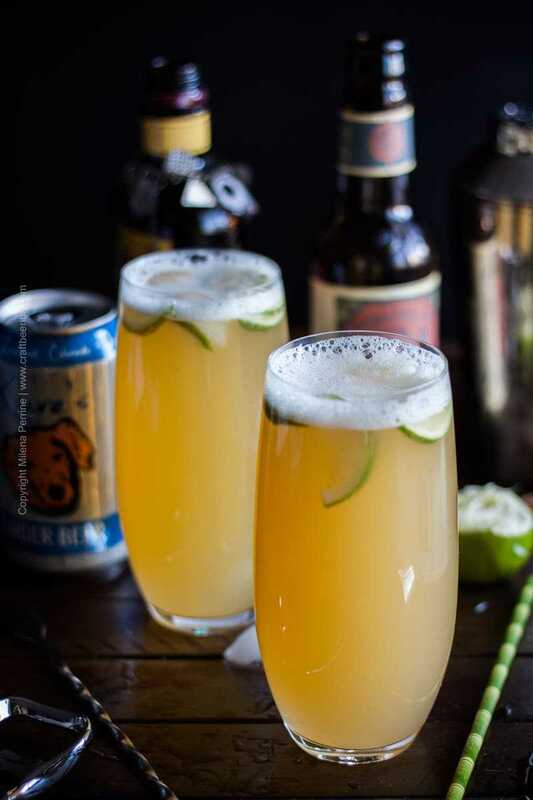 All you need to do is add your IPA to the ginger beer, shake your dark rum with a bit of freshly squeezed lime juice and mix them all together. You can find the full recipe here. Cheers, friends! Join the Hops Heads Beer of The Month Club for curated monthly shipments showcasing IPAs and hoppy pale ales from all over the world. Hi! We are the Perrines - Milena and Chris. We share tasty recipes centered around cooking with beer and pairing beer and food. With over thirty-five years of combined chef and avid home cook experience between us we have you covered! Learn more about Craft Beering or sign up for our bi-weekly new recipes & posts e-mails (below). Unsubscribe at any time. Your e-mail and privacy greatly respected. I think the Stormy IPA is a perfect name. It’s pretty stormy here right now snd even though it’s only 7 am I could go for one of these. It’s the holidays right? I might as well indulge while I still have an excuse :). And thank you for the reminder about your IPA pina colada. I might have to have one of those tomorrow and pretend it’s summer! Haha, why not? Cheers, Kelsie! Cheers! Looks perfect 🙂 Have a wonderful holiday, Milena!